Sheehy, Wallace, Goode-Walker: "SAVANNAH, IMMORTAL CITY: Volume I - Civil War Savannah"
Author Barry Sheehy's Civil War Savannah project initially had as its object the documentation of military sites in and around the city. This limited goal was soon transformed into a massive four-volume set, the first two of which have been published by Emerald Book Company. Although many war related persons and events are discussed inside, Savannah, Immortal City: Volume I - Civil War Savannah primarily examines the port's antebellum architecture. Volume II looks at slave economics [released as Brokers, Bankers, and Bay Lane: The Savannah Slave Trade and Business Model 1850-1865], while upcoming III and IV deal with Savannah's Civil War cemeteries and military sites located in Chatham and surrounding counties. At its heart, Savannah, Immortal City is a wonderful photographic register of hundreds of antebellum structures (houses, business, churches, schools, etc. ), organized around the port city's famous squares. An image of each building is provided by the series's skilled photographer Cindy Wallace. Additionally, caption information about each structure's building date, style, ownership, and use are provided, as well as Civil War contexts of interest. Twenty-one standalone chapters expand upon Savannah's wartime contributions in trade, manpower, and POW camps, while also highlighting the activities of individuals connected to the city [both well known (e.g. Phoebe Yates Pember) and obscure (e.g. Mother Mathilda Beasley, Father Peter Whelan, and Berrien Zettler)]. Contributor Vaughnette Goode-Walker adds her expertise to the book's features on the free black and enslaved populations of Civil War Savannah. The text is documented and the bibliography indicates a satisfying variety and depth of source material. From its red cloth binding and quality glossy paper to the number and variety of illustration, Savannah, Immortal City is a classy production at a reasonable price. Both original and archival maps offer the reader a reasonably good view of the city layout and military defenses. The sections of street and square maps accompanying each chapter are also helpful visual aids. An epilogue explores the Civil War connection between Savannah and Montreal, and a trio of appendices offer an address conversion table, a list of Confederate camps in and around Savannah (courtesy of William Smedlund's pioneering work), and a list of Ladies Gunboat Society members. Both readers and serious researchers looking for a detailed guide to Savannah's surviving antebellum structures and their role in the Civil War will want to add a copy of this book to their collections. Author Barry Sheehy also has gone to admirable lengths bringing to light many lesser known persons and events associated with Savannah's Civil War history. Savannah, Immortal City is an outstanding publication, and one looks forward to the completion of the series. 1. Turmoil on the Rio Grande: The Territorial History of the Mesilla Valley, 1846-1865 by William S. Kiser (TAMU Press, 2011). The region experienced much in the way of conflict during the mid-19th century, from battles and boundary disputes between the U.S. and Mexico through a Confederate invasion during the Civil War. 2. Confederate "Tales of the War" in the Trans-Mississippi, Part 2 1862 edited by Michael Banasik (Camp Pope Pub., 2011). Read a short description here. Part 1 was very good and I look forward to all new volumes from this sub-series of Camp Pope's indispensable Unwritten Chapters of the Civil War West of the River series. 3. Lincoln and the Election of 1860 by Michael S. Green (SIUP, 2011). 4. Abraham Lincoln and Horace Greeley by Gregory A. Borchard (SIUP, 2011). These two are new volumes from Southern Illinois Univ. Press's Concise Lincoln Library series. 5. Plenty of Blame to Go Around: Jeb Stuart's Controversial Ride to Gettysburg by Eric J. Wittenberg and J. David Petruzzi (Savas Beatie, 2011). Undoubtedly at least partially inspired by the Sesquicentennial, paperback reprints of both old and recent titles are being released across the board at a vastly increased scale and clip. A great book, Plenty of Blame is certainly worthy. Hubbart, ed. : "AN IOWA SOLDIER WRITES HOME: The Civil War Letters of Union Private Daniel J. Parvin"
Over the years, a fairly standard format for publishing edited Civil War letter collections has emerged and been accepted. With some variation, the letters are reproduced in their entirety and presented in chronological order. If the publication is to be organized into chapters, the editor offers short introductions to each in addition to footnotes elaborating on persons, places, and events mentioned in the letters. Brief transitional narrative pieces linking each letter to the next are also commonplace. However, in presenting his own ancestor's letters, retired judge Phillip A. Hubbart attempts something quite different. An Iowa Soldier Writes Home: The Civil War Letters of Union Private Daniel J. Parvin is instead organized by theme. As a member of the 11th Iowa Volunteer Infantry, Private Daniel Parvin participated in several major campaigns, including Shiloh, Corinth, Vicksburg, Meridian, and Atlanta. During the latter, Parvin was struck in the jaw, a wounding that shattered teeth and bone and would eventually contribute to his death years later. The battle experiences related in Parvin's 117 surviving letters are richer than most, and his descriptions of active campaigning and camp life in the western theater, as well as pointed opinions about leading figures of the day, are noteworthy. Like many Union soldiers, Parvin often directs more vitriol at anti-war Democrats back home than he does toward Confederates on the battlefield. Hubbart's chapters ["Military Engagements", "Opinions of Contemporary People and Events", "Army Camp Life", and "Miscellaneous Army Experiences and Other Matters"] examine broad themes addressed by Parvin. Under each are many subheadings covering diverse subjects like politics, blunt assessments of individuals like Grant and Lincoln, and thoughts on illness, camp assignments, food, discipline, travel, reenlistment and much, much more. Largely made up of a series of letter excerpts with brief commentary (although some letters, mostly found in the chapter covering battles, are reproduced in their entirety with the relevant section in italics), the editor's approach is most useful for readers seeking specific information. On the other hand, the same effect might be achieved with a good index. An unfortunate consequence of Hubbart's chosen method is that his book does not contain full transcriptions of all 117 letters. Inserting these in chronological order in an appendix would have made the book much more valuable. Also, Hubbart did not intend his work to be scholarly and this is borne out in the paucity of source material applied to the annotations, as well as their irregular format. Whatever one thinks of Hubbart's unique and flawed style of presentation [I do think the traditional method remains superior], the substantial nature of Parvin's writings (especially on military matters) makes the book well worth the effort for western theater campaign generalists and particularly for readers concerned with Iowa soldiers and the Iowa home front. 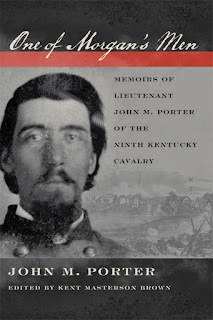 "One of Morgan's Men: Memoirs of Lieutenant John M. Porter of the Ninth Kentucky Cavalry"
I'll take editor Kent Masterson Brown's word for it that memoirs written by the officers and men of John Hunt Morgan’s various Confederate cavalry commands are rare. 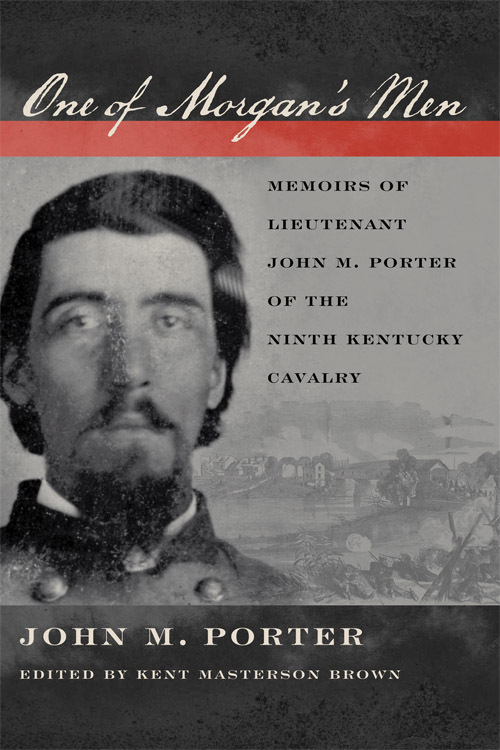 Given that, the publication of One of Morgan's Men: Memoirs of Lieutenant John M. Porter of the Ninth Kentucky Cavalry (University Press of Kentucky, 2011) is significant news for students of Confederate mounted operations in the western theater. Even better, it is a great source of information. Porter joined the Confederate army at Bowling Green, Kentucky in 1861. Taken prisoner at Ft. Donelson and released, he attached himself to John Hunt Morgan’s command in July, participating in several celebrated raids, including Morgan’s disastrous 1863’s “Great Raid” across the Ohio River that resulted in the capture of most of his force. Unfortunately for Porter, this second imprisonment was essentially for the duration. In addition to Porter's penning a remarkably accurate reminiscence, Brown appreciates the Kentuckian's in depth coverage of many obscure mounted operations poorly documented in the literature. These include the post-Stone's River fighting and raiding activities by Morgan's division around the towns of Auburn, Milton, Liberty, and Snow Hill. An obscure yet successful February 1863 reconnaissance mission that also destroyed much in the way of enemy material resources is also detailed in the book. Brown's lengthy and scholarly notes add context, amply assisting the reader in the sorting out of persons, places, and events mentioned in the text. The book's operational maps tracing the various raid routes forged by Morgan's men are similarly helpful. Porter's memoir is very deserving of publication, and the editing work that ultimately brought it there is exemplary. All students of the Civil War in Kentucky and Tennessee, particularly those readers interested in Confederate cavalry operations, will benefit from reading One of Morgan’s Men. 1. Lincoln and the Border States: Preserving the Union by William C. Harris (UP of Kansas, 2011). I'm happy that Kansas sent me a review copy of this one. The Civil War in the border states (esp. Missouri and Kentucky) is my primary interest and I've had my eye on Harris's book for a long time. There have been some good studies released recently, including a nice look at civil rights in Missouri, but Harris surveys in a single volume the military, social, and political challenges presented by all of them to the maintenance of the Union war effort. 2. The C.S.S. Albemarle and William Cushing: The Remarkable Confederate Ironclad and the Union Officer Who Sank It by Jim Stempel (McFarland, 2011). Given the thin bibliography, I have my doubts that this book will add much to what's already been written about Cushing and the Albemarle, which is a great story if you're not familiar with it. I've been informed that Camp Pope Publishing's Confederate "Tales of the War", Part 2 is at the printer and will be available soon. You can read my review of Part One here. Edited by Michael Banasik, I believe it will be Volume VIII of the excellent "Unwritten Chapters of the Civil War West of the River" series. "The 1862 portion of these “Tales of the War” covers in great detail the Battle of Pea Ridge, Arkansas (March 6–8, 1862), as well as the engagements at Lone Jack, Missouri (August 16, 1862) and Prairie Grove, Arkansas (December 7, 1862). Also presented are various pieces concerning the “Palmyra Massacre” (October 18, 1862), soldiering in Arkansas with an Arkansas regiment, and some short “Bits and Pieces” that are associated with the Trans-Mississippi, but have no real date associated with them. The Appendices include the most comprehensive Confederate Order of Battle ever presented on the Battle of Pea Ridge as well as the first recorded publication of General Blunt’s request for a truce at the Battle of Prairie Grove, that had been lost since 1862." The price will be $17.95. Jeff Patrick is the NPS librarian at Wilson's Creek National Battlefield. His Civil War publications include his editing of Thomas Wise Durham's memoir Three Years With Wallace's Zouaves and Fighting for Liberty and Right, the diary of William B. Miller that he co-edited with Robert Willey. His latest book, and the subject to be covered here, is Campaign for Wilson's Creek: The Fight for Missouri Begins, an excellent overview of Union general Nathaniel Lyon's 1861 campaign. DW: Hi Jeff. My most recent visit to WCNB was back in 1997. What are the most noticeable changes to the park and visitor center that have occurred since? JP: We have made a number of significant changes to the park since 1997. In 2003, we dedicated a new wing to our Visitor Center, consisting of an exhibit room, multipurpose (meeting) room, a dedicated space for the library, and administrative offices. In 2005, we purchased the General Sweeny Museum (the collection and museum building), and the adjoining house and property (20 acres). We have also purchased about 200 acres on the southwest corner of the battlefield (site of the Southern encampment a few days before the battle and a Union camp in November and December 1862), and have secured conservation easements on other property adjoining the battlefield. And finally, in 2009, we purchased a large private collection of Missouri Civil War photographs owned by the late Jim Joplin of Springfield. All in all, some significant achievements in the past decade or so. DW: What WCNB events and initiatives do you and your fellow staff members have planned for the Sesquicentennial period? JP: Our major sesquicentennial events concluded a few weeks ago with the battle anniversary commemoration on August 10 and the reenactment on August 12-14 (the latter hosted by the Wilson’s Creek National Battlefield Foundation and held on nearby private land). That’s not to say that we’re “off the hook” for the next four years. We recently launched a Virtual Museum of the Civil War in the Trans-Mississippi Theater (www.civilwarvirtualmuseum.org) featuring artifacts from our collection, we will launch a new virtual “Trans-Mississippi Photograph Album” before the end of the year, and we are about to start planning new Visitor Center exhibits that will also tell the story of the war west of the Mississippi River. I’m sure we’ll be involved in other 150th ceremonies and activities in our area as well. DW: A number of NPS historians and park rangers associated with eastern theater battlefield parks have joined the blogging ranks. Can you speculate on why their western and Trans-Mississippi colleagues have not shown the same vigor? JP: I’ll admit that my western and Trans-Mississippi colleagues have been a little hesitant to jump into blogging, but that’s not to say that there aren’t some great blogs out there relating to our particular corner of the war. Dr. Jane Johansson’s “Trans-Mississippian” blog is excellent, and my NPS colleagues Bob Pollock and Lee White have blogs that are well worth reading as well (the “Yesterday and Today” and “Army of Tennessee” blogs, respectively). Matt Matthews, another friend of mine, also maintains a great site called “Jayhawkers and Red Legs,” dealing with those controversial but fascinating characters who operated in eastern Kansas and western Missouri. I think others will appear as we move through the 150th cycle. DW: What are some of your favorite and/or most historically significant manuscript holdings at the park library? JP: As park librarian, I handle “bound, printed and other material”—in other words, books, maps and microfilm. The park’s archival collection falls under the bailiwick of the museum curator and museum technician. That said, we are fortunate to have some wonderful archival materials in the park collection. The Albert Ellithorpe diary, for instance, was started by a Missouri Confederate soldier named George Falconer, then “captured” by Union Indian Home Guard officer Ellithorpe at a skirmish in the Indian Territory in 1862. Ellithorpe included a number of interesting details about life in the Trans-Mississippi Theater, such as when two Southern ladies joined him at breakfast. He described them as “regular snuff lickers, smokers & tobacco chewers,” and “a fair specimen of Arkansas she rebels.” And of course, we have some “pieces of the true cross,” such as the pass that allowed Brigadier General Nathaniel Lyon’s relatives to move through Southern lines to retrieve his body. Fortunately, quite a few items from our archives have been digitized and are now viewable at ozarkscivilwar.org. DW: It's been a while since I've checked out that site (www.ozarkscivilwar.org). I'll have to revisit it soon. Are there any pieces in the collection that you believe have been undeservedly neglected? JP: I think there are a number of “underutilized” pieces in the park collection. Our photograph collection is outstanding, thanks to the purchase of the Sweeney and Joplin collections. We also have a great weapons collection. Although we have representative examples of many Civil War arms, we do have a number connected with specific events in our theater, including a Sharps carbine used during the 1850s in “Bleeding Kansas,” and a rifle captured by Captain Nathaniel Lyon’s troops at Camp Jackson (St. Louis) on May 10, 1861. I’m also very proud of our flags and uniforms. Apart from our outstanding and often-reproduced “Cherokee Braves” flag, we have many terrific Trans-Mississippi Union and Confederate flags on display and in storage, and several identified uniforms. DW: Getting to your recent book, some very good Wilson’s Creek battle histories (e.g. the Bearss and Piston & Hatcher books) already exist. What prompted you to take your own shot at it? JP: Several years ago, my friend Dr. Don Frazier of the McWhiney Foundation stopped by the battlefield. 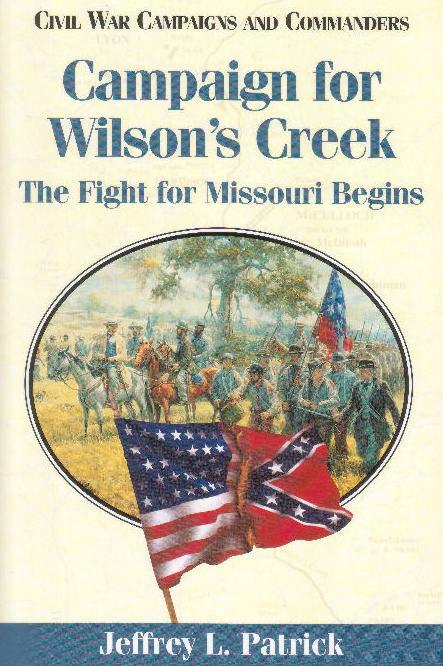 As we talked about our latest projects, he said, “We need a Wilson’s Creek volume in our ‘Campaigns and Commanders’ series—why don’t you do it?” I thought about it for a nanosecond and said, “Sure, I’ll give it a try.” In 2002, the McWhiney Foundation published an excellent volume on Pea Ridge and Prairie Grove by Bill Shea, so a volume on Wilson’s Creek seemed a natural companion piece. And, since the publication of Piston-Hatcher in 2000, a fair amount of new information has been uncovered about the campaign. DW: Writers generally deal harshly with John C. Fremont’s conduct as Nathaniel Lyon’s superior. In your book, you adopted a more sympathetic view of Fremont’s situation. Can you elaborate on that? JP: In my nearly twenty years at Wilson’s Creek, I’ve heard Fremont used as a “punch line” many times, by both historians who have researched the period, and by buffs who barely know his name. Only the mention of Franz Sigel elicits more chuckles from visitors, and that’s not entirely fair either. I must admit I have a bit of a soft spot in my heart for J.C.F. Although he was certainly in over his head when he took command of the Western Department, and made significant mistakes, in all fairness he had an incredibly difficult job and many challenges—dealing with Confederate forces in southeast and southwest Missouri and State Guardsmen in northeast Missouri, defending Cairo, Illinois, arming and equipping thousands of volunteers, dealing with his wife (just kidding), etc. I don’t believe that Fremont “sacrificed” Nathaniel Lyon, either. When it comes right down to it, Fremont told Lyon that if he remained in southwest Missouri, and didn’t retreat to the railhead at Rolla, he did so on his own responsibility. He could have acted more aggressively to help Lyon, but he didn’t abandon him either. DW: Speaking of Lyon, what is your opinion of the controversial profile of the general presented by Christopher Phillips in his biography Damned Yankee? Has the popular view of Lyon been unduly influenced by Phillips’s foray into psycho-biography? DW: I find myself somewhere in the middle, too, and would certainly welcome another scholarly look at Lyon's life and military career. In what other ways does your interpretation of the battle and campaign differ from that of previous writers and historians? JP: In very broad terms, my interpretation of the battle is similar to what you will find in other works. I devoted more attention to the fighting at Boonville and Carthage, though, as I think both actions had an enormous effect on the outcome of the campaign. Although I cited some of the standard sources (you really can’t avoid doing so), I also utilized material that other writers chose not to use, or information that has been uncovered in the last decade or so. And finally, I tried to stay within the bounds set for the “Campaigns and Commanders” series—a relatively short (less than 200 pages), fast-paced narrative, with lively writing and lots of quotes from participants. DW: Finally, are you working on any new publishing projects? JP: Like everyone else, I have several ideas “percolating.” I would like to have another go at Fremont and his “hundred days” in Missouri, making sense of just what went right and wrong during those crucial weeks in Missouri in the fall of 1861. I would also like to have a look at the 1st Iowa Infantry. Although the “Greyhounds” were only a ninety-day unit, and participated in only one major battle, at Wilson’s Creek, they were an interesting lot, and produced quite a bit of primary source material. And, in order to get away from the Civil War a bit, I’m editing the second volume of a Missouri soldier’s memoirs from the World War I period. DW: I've always thought that Fremont's time in Missouri was one of the most neglected and interesting periods of the war in the Trans-Mississippi. That would make for a great book length project. Thanks for your time, Jeff! JP: Thank you, Drew. Thanks for the opportunity to visit with you and your readers. I look forward to meeting them at Wilson’s Creek. Michno: "DAKOTA DAWN: The Decisive First Week of the Sioux Uprising, August 17-24, 1862"
The 1862 Great Sioux Uprising in Minnesota is second only to King Philip's War in the scale of white American civilian deaths, yet it has been overshadowed in the popular mind by many other western Indian conflicts. Fortunately, readers have access to a number of useful primary and secondary source publications dealing with the period. Broad overview studies are available from C.M. Oehler, Kenneth Carley, Jerry Keenan, Duane Schultz, Hank Cox, and John Koblas. For its coverage of the entire 1862-65 time span of the conflict, the best military study remains Micheal Clodfelter’s The Dakota War. 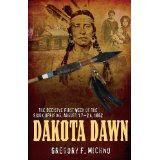 Gregory Michno's new book Dakota Dawn, however, is an impressive departure from the more general works on the subject, instead offering an intense narrative of the incredibly bloody first week of the uprising. Like the other studies, Michno begins his work outlining the sources of Santee Sioux resentment, most specifically the constant delays and deductions attached to the treaty subsidies and the corruption of licensed agency traders who were allowed to subtract their own claims from the annuities before payment to the Sioux. They are familiar tales for those who've read the earlier works, but the background explanations are well done in Dakota Dawn. What really sets Michno's book apart from all previous studies is his incredibly detailed microhistory of the first seven days of the uprising. The vast majority of civilian deaths occurred during this horrific period, with hundreds of men, women, and children killed by Indian attacks on isolated farmsteads and by coordinated assaults on larger targets like Fort Ridgely, the town of New Ulm, and the Santee reservation's Upper and Lower Agencies. In addition to newspapers, government reports, and a host of other published primary and secondary source materials, the author mined historical society manuscript collections and federal Depredation Claims documents in order to provide the most thorough account yet attempted of the white civilian experience of the uprising. As Michno explains, most of the claims have not survived to the present, but so much material is presented in the book that it almost seems like the circumstances surrounding every death are included. Some readers may view this as overkill, believing representational examples would suffice, but Michno's method is really the only way to effectively convey the scale of the horrors perpetrated on the largely defenseless populace, many of whom were recent immigrants from the German states and Scandinavia. Along the way, Michno dispels some of the mythology surrounding the events of the period. For example, he found no eyewitness evidence that would support the oft repeated claims in the literature about Andrew Myrick's infamous "let them eat grass" retort to the entreaties of starving Sioux. No individual present at the time of the alleged comment ever mentioned such words coming from Myrick. Along similar lines, the author concludes that the story of Myrick's body being found with the trader's mouth stuffed with grass is similarly apocryphal. The number of civilian deaths has always been subject to a wide range of estimates in the literature, usually between 400 and 1,000. In the book, there is no fresh investigation of these figures. The subject is treated briefly, with Michno comfortable with the former number. The descriptions in Dakota Dawn of the desperate fighting at New Ulm and Fort Ridgely are among the best available. The differences in military culture are apparent, with the initial heavy numerical superiority of the Sioux dissipated by their lack of organization and unified command. In contrast, the soldiers and civilians at Fort Ridgely and citizens and militia at New Ulm came together quickly, making the most of their small numbers and mixed collection of small arms. Artillery undoubtedly contributed heavily to the success of the Ridgely defenders. New Ulm was even more of a close run thing. In describing the conduct of the town's defense, the leadership of Charles Flandrau is often praised by writers, but Michno found his efforts to be costly and of questionable competence. Disaster was narrowly averted on more than one occasion. The book's 19 maps, drawn by Michno himself, are an important contribution. While not of great artistic merit, they are rich in detail, pointing the reader to the approximate location of practically every building and house mentioned in the text. The New Ulm and Ft. Ridgely battle maps were also useful. The volume is further illustrated with a photo gallery of period and modern images. Dakota Dawn is essential reading for students of the Indian Wars of the West, as well as the Civil War in the Trans-Mississippi theater. For the first time, the ghastly events of the opening stages of the 1862 Great Sioux Uprising in Minnesota have been sufficiently documented. Hopefully, Mr. Michno will see fit to continue his work, as that terrible week in August 1862 proved to be only the beginning of a much wider conflict, one that would involve thousands of combatants and last until 1865.